Heath Daniel "Sends in this J"
This is my Dad's Henry J that we race on a weekly Basis. We built it from the ground up. It's got a blown small Block Chevy on pump gas with carbs and we can't slow it down enough to run in the local 6.00 heads up index classes. All this Henry wants to do is fly. The slowest we have been able to make it go is 5.99 in the 1/8th mile(under driven with 8.5:1 compression and 10.5 inch wide tires). She's all steel with the factory front end (welded together so it will tilt) and we even kept the ultra cool factory removable quarters. We are still hammering the Henry J and the more we push her the better she likes it. We switched over to E85 fuel and she jumped up a tenth of a second in ET. This simple change prompted us to start www.RaceonE85.com to get the word out there about this awesome fuel and to try and pay a few bills. 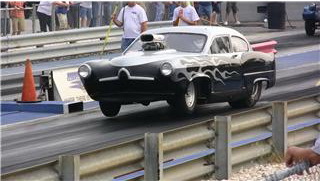 Here is a picture from a Carolina Gasser race www.CarolinaGassers.com last year.